Bernadette Noll at SlowFamilyLiving.com brought up a terrific point. Do you have a slow barometer to gauge whether your life feels managable or not? Without really knowing it, I have one, too. Typically during the week, I don’t schedule more than two appointments a day outside of my regular routine. With the kids’ schedules and extracurricular events, more than two activities a day starts to feel hectic. Do you have a slow barometer, too? The fifth in a series of work-life balance stories brings us to Los Angeles and New York where Yelizavetta Kofman and Astri von Arbin Ahlander, respectively, offered their astounding insights into Generation Y’s views on work, life ,and parenting. As co-founders of The Lattice Group that specializes in Gen Y workplace issues, this dynamic duo provided an astounding breadth of knowledge in all areas of life. They view balance as an impossible notion and equate the attempt with trying to win the war on drugs. What they do believe, however, is the ebb and flow of life. Sometimes they see themselves as working more or working less, depending on their life situations. Embracing entrepreneurialism is the underlying factor in providing the most flexibility and for striking an equilibrium in our lives. What I found most empowering about their message is we can climb the lattice to success, making lateral moves as equally justifiable as straight shots to the top. Facetime is put into question as Gen:Yers tend to embrace a more mobile work style. Below you will find the entire interview. So grab a cup of your favorite hot beverage and enjoy the read! CLH: Which workplace issues are most pressing for Gen Y today? Liz: This is a difficult question because Gen Yers are so young: they don’t have kids or families yet and most, at least in the United States, aren’t thinking too far ahead. A recent survey of graduating college seniors by the National Association of Colleges and Employers (NACE) reported that out of fifteen possible job attributes, the top three chosen by American students were: opportunity for advancement, job security, and a good insurance package. So Gen Yers, understandably, are concerned mainly about health insurance and security. In European countries, Gen Yers don’t have these workplace concerns because they are provided universally by the government. They are more likely to answer that they are concerned with issues of flexibility (the ability to work from anywhere and to have flexible hours). I would say that flexibility is definitely a main concern for American Gen Yers, too. Gen Yers grew up with the internet. They don’t understand why “facetime” at an office is so sacrosanct when they know they can do the same work from somewhere else. I would say many Gen Yers are looking for a workplace that is more than just a paycheck. They want to feel useful and connected to an organization, which is why strict hierarchies are a turn-off. So I would say the availability of certain benefits like health insurance, flexibility, and “buy-in” are the most pressing workplace issues for Gen Y. That, and finding a job in this economy! Astri: I agree with Liz, but would like to underscore the Gen Y resistance to facetime. Nearly all of the Gen Y:ers we spoke to expressed frustration with long work hours and what they perceived as time ill spent because of the value superiors put on facetime. As one young engineer commented, many of his peers would take more time to do their tasks than they needed in order to drag their work out over more hours- putting in a lot of late hours was considered a measure of diligence and commitment, no matter how those hours were spent. As Liz commented, Gen Y:ers are of a high-tech generation that know they can work in many places other than in an office and a lot of them expressed a desire to be more flexible in when and where they work. This will only become more important when they have more complex family concerns. CLH: How do Gen:Yers view work-life balance? Liz: Again, this is different whether we’re talking about Americans or Europeans. American Gen Yers largely view work-life balance as a personal responsibility. You either figure out how to balance your work with the rest of your life, or you don’t. Sure, it would be nice if employers provided an environment conducive to work-life balance–and it may go a long way toward reqruiting and retaining Gen Yers–but, mostely, it’s seen as a personal responsibility issue. This is not the case in Europe, where Gen Yers demand a lot more help from their government and employers. What work-life balance means, exactly, is very different depending on the individual. For some, it means being able to balance having kids and a career in the future. For others, it means the ability to sustain interests and relationships outside of work. Astri: The difference in views of work-life balance between American and European Gen Y:ers was striking. While American Gen Y:ers largely considered it a personal problem for which they had to engineer their own personal solutions, European Gen Y:ers expected a lot of help from companies and from society as a whole. Europeans thought that work-life balance was a right that they should be assisted in getting while American Gen Y:ers viewed it as a highly desirable goal which they generally had vague notions about how to achieve. The result is that Europeans are likely to make more demands than their American counterparts. The danger with treating work-life balance as an individual’s problem and not society’s is that people risk feeling alienated in their struggle to “figure it out,” and thus don’t start making the kinds of demands that eventually lead to systemic change. CLH: Most Gen Y are still ‘kids’ themselves. How do you think Gen Y will handle raising kids differently than, say, Gen X? Liz: Frankly, this is a big mystery. Gen Xers pretty much invented the phenomena of “intensive parenting” — think yoga for infants, countless sports practices and music lessons, and greater competition for college admissions. I really don’t know if intensive parenting will wane with Gen Y. Competition for college admissions will probably only get more cut-throat. On the other hand, the current economic crisis and “thrift chic” mentality may drive some Gen Yers to reject this kind of child-rearing. Driving a Hummer full of toddlers to soccer practices everyday isn’t exactly good for the environment, either, and Gen Y is more concerned with sustainability than previous generations. I believe “shared parenting” (a la Lisa Belkin’s New York Times Magazine article) will become more prevalent, but probably not the norm. Unless the government and employers step-up and provide paid parental leave to both men and women, women will likely remain the primary caregivers. Astri: The Gen Y:ers we talked to, both men and women, emphasized the important of having time for children, of being there with them. Male Gen Y:ers didn’t want to be distant fathers (as many of their own fathers had been) and female Gen Y:ers didn’t want to be the sole caretakers (as many of their mothers had been). And so, there is some hope that Gen Y will actually “parent” rather than “mother.” But, as Liz said, before American policies become more family friendly and gender neutral (such as paid parental leave for fathers as well as mothers, the de-stigmatization of flex policies as “female” and a denoting less career ambition etc), it is a mystery how Gen Y parents will realize the goal of equal parenting. CLH: How do you define ‘balance’? Liz: Personally, I don’t think you can ever achieve “work-life balance.” That would be like winning the “war on drugs”– impossible. The Spanish refer to this idea as “work-life reconciliation” and I think that’s more attainable. Or work-life effectiveness. In my own life, I know there will be times when I put my work ahead of my family (they’ll get over it). Other times, family will definitely come first. I think the first step is trying to figure out what you want in life. I want to have a job that I love and be very, very good at it. But, at the end of the day, I know my relationships with family and friends will be more important to me, so I am prepared to make some sacrifices in terms of pay and prestige. Eventually, I want to have a job that allows me a lot of flexibility in terms of my day-to-day hour, I want long vacations (I’m talking like 4 weeks in a row), and I may want to be able to have reduced work hours when my children are very young. Will I be able to achieve all this? Certainly not in the very near future, but I do think it’s possible. I think the key to achieving “work-life balance” is finding a partner who shares your goals, or at least is willing to help you achieve your goals. Astri: Liz hit the nail on the head: achieving work-life balance has a lot to do with who you choose to build the “life” part with. We heard this over and over again in the interviews that we conducted with seasoned professionals. The ones who truly “made it” always cited the importance of an understanding spouse so that the work-life equation was never theirs alone to bear. My tip is to make sure you know what your partner is expecting right off that bat (those conversations might seem awkward, but they can really be enormously instructive). For me, career is incredibly important and so finding a partner who respects that is key. But saying career is important doesn’t mean that family isn’t. I am fundamentally opposed to the status quo of what we call the “ladder society,” where a successful career hinges on a consistent, linear upward-bound trajectory. My idea of balance is linked more to a “lattice career,” meaning a more sequential development where both men and women can make lateral moves as well as slow down for a while without losing all of their momentum. I hope to work all of my life, but I expect to work differently in different phases of my life. Balance for me is making that kind of a lattice lifestyle possible. How to do that? As many of our Gen Y interviewees on both sides of the Atlantic recommended: by being entrepreneurial and having as much flexibility as possible. CLH: Thanks so much for your valuable insights! Liz & Astri: Thank you! Today is the fourth in a series of conversations with work-life balance experts. A self-proclaimed ‘anti-balance expert,’ Michelle Nichols, owner of HugYourKidsToday.com and author of a book of the same name, shares her views on today’s economic crisis and living with your priorities in order. I believe that work-life balance is the wrong goal. When you’re trying to hold onto your job AND keep your family relationships going, then ‘balance’ is an illogical, impossible – and downright dangerous plan. It’s illogical because work and family are not of equal value, impossible because there is no conversion rate for work and family so they can’t be balanced, and dangerous because work is ultimately replaceable and family is irreplaceable so your health can be put at risk if they are made equal. What is your top priority? What comes second? Make a list today. Check it often. Priorities often shift, depending on where the fire’s burning hottest. 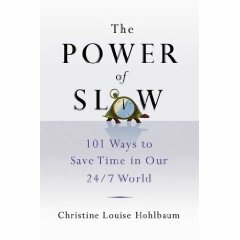 Engage in the power of slow by raising your consciousness about what’s truly important. As the blaze continues to raze through our global village, know this too shall pass. How will you spend your time as it does? 1. Facts. These are scary times and when we’re frightened we all tend to catastrophize. From “my 401K is down 40%” our thoughts quickly leap to “I’ll have to work at MacDonald’s until I’m 80.” From “I’ve been laid off” to “I’ll never get another job.” From my house is worth so little,” to “I’ll never be able to buy my dream house.” Instead, we need to get perspective, look at the facts, and plan our next steps realistically-not pessimistically. No hope equals depression. Catastrophizing makes us feel hopeless, like victims. Factualizing allows us to plan and act. It motivates us as we see that we’ve survived low points before and we will again. We feel more empowered. 2. Feelings. Changes like these engender feelings of fear, anger, and impotence. To bury them or get mired in them is unhealthy. To explore them is healthy and healing. First, finish this unfinished sentence, “I’m scared to death that…” listing all the things that pop into your head (I’ll get divorced, won’t be able to send the kids to college, will get fired, won’t be able to care for my elderly mom, etc.). Now the boogey man -or men-are out from under the bed. In the light, they look a bit less threatening. Identified, we now can look at what we can do to protect ourselves from the worst. Fear of the unknown lessens to uneasiness as we mentally imagine how we might cope. Our control and confidence rise and our stress goes down a notch. 3. Focus. One of the worst things we can do right now is add to the global whining. Focusing on what’s wrong, what we lost, and how bad things are is only good for data-gathering and a little emotional venting with friends. Past that, we must consciously shift our focus to what we have, what we’re grateful for, what we can still enjoy, and what we can do now, given the current reality. It’s called accepting what is, being grateful for all the joy that is free, and focusing forward on whatever we can control. Doing things that you love to do, things that engage you is an important element of life satisfaction. 4. Friends. All research on happiness indicates that having a good support circle of friends is a major contributor to positive emotions. Wealth and status and even being married do not make us happier or healthier. Positive relationships do. So, reaching out, laughing with people you care about, listening, being validated for who you are not what you do are what you have…that is uplifting. 5. Family. Research tells us that using your days in meaningful ways is critical to high levels of happiness. That contributing in some way to the well-being of others, making the world the family of man-a little better place is what makes us go to sleep with a smile on our faces at night. If we’d count our good deeds instead of sheep, we’d all being getting a better night’s sleep. My soul feels more than tickled. It’s downright alert after reading Suzanne’s wisdom. The economic downturn can mean an emotional upturn for us all. During a brief email exchange with Kevin W. McCarthy, the On-Purpose® guru, he pointed out the differences between vision, purpose, values, and mission. Vision is what you see before you. Purpose resides in the heart. Mission is completed through action. Values reside inside. Since pictures speak a thousand words, I asked if I might have permission to post this image. He agreed. His impressive client list includes Hewlett Packard, WebEx, Cisco, and the Department of Defense, among others. 1. Off kilter is the new norm. To live powerfully you must live a memorable life. 2. To create a memorable life, you have to apply wisely your most precious assets – your time, your energy, and your focus. 3. Invest your Energy, Time and Focus (ETF) in your purpose. You will be amazed at the ROI multiples. Make your purpose your growth trust-fund. Make daily and weekly deposits. 4. You are here to transform the world. To bring light to darkness. 5. You transform the world by transforming you. By investing and growing your precious assets. By realizing the potential of this moment. By being at full in it. 6. Why would you put your energy, time and focus (ETF) into anything unless you intend for it to be transformed for the better – unless you wish it to be the best it can be? 7. You grow at the edge of your envelope. At the point of meeting the unknown. Where you expand beyond to meet your unknown. Having recently experienced the edge of my own envelope in which I sustained a few spiritual paper cuts, I would say Aviv is one smart man. It makes me want to jump on the next airplane to one of his sessions. He embraces the power of slow and purposefulness we all are born with! This is the first in a series of interviews with top thinkers in the work-life balance community. Debbie Mandel, M.A., author of Addicted to Stress: A Woman’s 7 Step Program to Reclaim Joy and Spontaneity in Life, told me in an email interview how she views the current slowdown. “There is recess in recession. Children learn better after recess, so this is the time to collect your energy and regenerate. • It’s time to reclaim your identity – do you know what you uniquely bring to the table? • Do something creative. Creativity in one area transfers to another. • Exercise to shed stress, feel empowered and organize your day around good health. • Manage the small stressors you have control over because they inundate and overwhelm. It’s time to reevaluate, not devalue, what we have and who we are. I would also suggest challenging yourself to a new routine by changing just one thing you do every day. As Debbie says, you don’t have to answer the knock if you don’t want to and even a slight shift in your habits can make all the difference!